CD is an immune-mediated systemic disorder elicited by gluten and related prolamines in genetically susceptible individuals and characterized by the presence of a variable combination of gluten-dependent clinical manifestations, CD-specific antibodies, HLA-DQ2 or HLA-DQ8 haplotypes, and enteropathy. CD-specific antibodies comprise auto antibodies against TG2, including endomysial antibodies (EMA), and antibodies against deaminated forms of gliadin peptides (DGP).1 Although the importance of CD auto-antibodies is enormous; the histology is not less important, as a distinct pattern of histological abnormalities has been observed in CD, and it has become clear that a whole spectrum of histological signs may be present, ranging from a normal villous architecture to severe villous atrophy.2 In this series, we describe how CD diagnosis is made through high resolution endoscopy, bulb and descending duodenum biopsies, hematolxylin-eosin staining, immune histochemistry and HLA-DQ2/HLA-DQ8 haplotypes, when CD is suspected by clinical findings, but have negative serologic auto-antibodies. 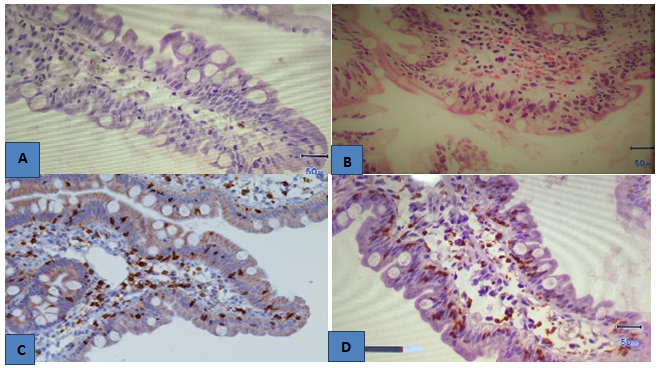 This is a series of consecutive clinical cases, with a number of digestive and extra-digestive signs and symptoms, in which the sum of clinical manifestations plus endocopy, histology, haplotypes and remision of signs and symptoms on GFD made the CD diagnosis without positive auto-antibodies for IgA anti-TG2 and IgG and IgA anti-DGP. Once CD is suspected, CD auto-antibiodies are indicated (IgG anti-DGP, IgA anti-DGP, IgA anti-TG2). Blood samples were obtained at CIAD, (Centro de Investigación en Alimentación y Desarrollo [Food and Research Development Center]) in Hermosillo, Sonora, Mexico, which processed the blood samples, and at Hospital San José, in Hermosillo, Sonora, México, which sent the blood samples to a private national reference laboratory in México City. Duodenal biopsies were studied by JMCC; if he suspected CD, he recommended immuno-histopathology to subjects or their parents, if subjects were minors. Follow-up was conducted by JBEV, recopilation of endoscopic images are by FPG and recollection of blood samples by MR.
We included patients subjects of any age, in whom CD was suspected due to clinical findings. Clinical findings are shown in Table 1; CD auto-antibodies are shown in Table 2; and endoscopic, histology and HLA-DQ2/HLA-DQ8 haplotypes findings are shown in Table 3. Signs and symptoms, as shown in Table 1, were predominantly digestive; only one patient reported extra-digestive manifestations exclusively, except for recurrent mouth ulcers; 9 have digestive findings; abdominal distention was the most frequent sign, it might have been the only finding of CD; other patients reported chronic signs and symptoms for years without a diagnosis, in which chronic diarrhea, nausea, vomiting, abdominal distention pain might have been present for years before a diagnosis was made Figure 1, Figure 2. All of the patients are symptomatic, 9 are MARSH 3 A, 2 are 3 B, and 1 is MARSH 2; neither of them are positive for IgA for anti-TG2 and IgA anti-DGP, only four are positive to IgG anti-DGP and eight are negative (Table 1-3). Figure 1 (A) Normal endoscopic villus view of duodenum of a 12 years male with non coeliac, non allergic gluten sensitivity. (B) Endoscopic views of villus atrophy in duodenum in CD. Figure 2 (A) Normal villus of duodenal mucosa with preserved epithelium, goblet cells and lamina propia with scarse lymphocytic infiltration. (B) Hematoxylin eosin stain. Flattened villi of the duodenum, epithelial crypt hiperplasia and lympho-epitheliosis. (C) Immuno-histochemestry for CD3 un duodenal mucosa. Positive lymphocytes are seen on duodenal mucosa and lamina propia. (D) Dense infiltration by CD8+ lymphocytes in duodenal mucosa. Nausea, vomiting, chronic diarrhea, IAC. Nausea, throw up, chronic diarrhea, abdominal pain, IAC, recurrent mouth ulcers, enamel falling, fibromyalgia, fatigue, herpetiform dermatitis. Gastric and small bowel dilatation with pseudo-obstruction, failure to thrive and malnutrition, IAC. Despite the strong arguments in favor of CD-specific auto-antibodies as mentioned above; the association of clinical backgrounds, high-resolution endoscopy, histology and haplo typing constitutes a firm association for CD diagnosis. In this series, all the patients have CD without CD-specific auto-antibodies. Herpetiform dermatitis is not only manifested by blisters, it could be seen as plaques of pruriginous papulae on elbows and thighs, which appear and disappeared over years as occurred in patient 2. Perhaps, the quality determination of CD auto-antibodies may be the difference between the United States and Europe, on the one hand. On the other hand, in Latin America, we still depend, to a great extent, on clinical backgrounds, firstly, and laboratory tests, in second place; thus, we still depend on histological tests for the correct diagnosis of CD. CD has been changing over the last 30 years, evolving from a rare enteropathy to a multiorgan systemic disease which prevalence has increased enormously, 1:3500 to 1:100 in genetic susceptible individuals, related to major leukocyte antigen HLA-DQ2 in 95% and HLA-DQ8 in 5% of CD patients with enteropathy. Diagnosis of CD has been changing from histology as gold standard, to immunologic diagnosis in USA, Europe and Asia. The onset CD can begin at any age, after the introduction of gluten to the diet. Diagnosis of CD requires a high degree of suspicion. Mothers and caregivers of infants and toddlers must be intentionally asked about signs and symptoms; children, adolescents and adults have to be intentionally asked about signs and symptoms. Signs and symptoms can be digestive: Abdominal distention, intermittent or chronic diarrhea, nausea, vomiting, epigastric and retro-sternal burning as it is gastro-esophageal reflux, chronic constipation. Not only enamel defects; also falling of enamel in pre-school and school children. To ensure a correct CD diagnosis, it is advisable to conduct bulb and descending duodenal endoscopy biopsies with preferably a high-resolution endoscope, if specific CD auto-antibodies are positive or negative when there is a high-clinical suspicion of CD: abdominal distention, chronic diarrhea, constipation or gastro-esophageal reflux, recurrent mouth ulcers, falling or enamel defects, treatment-resistant ferropenic anemia, osteopenia, osteoporosis, fractures with slight stimuli, failure to thrive, stunted growth, delayed menarche, first-degree family member with CD, diabetes type 1, autoimmune thyroiditis, Down syndrome, Turner syndrome, Williams syndrome, selective IgA deficiency, arthritis, hepatitis, epilepsy with occipital calcifications. Husby S, Koletzko S, Korponay-Szabó IR, et al. For the ESPGHAN Working Group on Coeliac Disease Diagnosis, on behalf of the ESPGHAN Gastroenterology Committee. Journal of Pediatric Gastroenterology and Nutrition. 2012;54(1):136–160. Marsh MN. Grains of truth: evolutionary changes in small intestinal mucosa in response to environmental antigen challenge. Gut. 1990;31:111–114. Rewers M. Epidemiology of celiac disease: what are the prevalence, incidence, and progression of celiac disease? Gastroenterology. 2005;128(4Suppl1):S47–51. Van de WY, Kooy YM, Van Veelen PA, et al. Small intestinal T cells of celiac disease patients recognize a natural pepsin fragment of gliadin. Proc Natl Acad Sci USA. 1998;95:10050–10054. Dieterich W, Ehnis T, Bauer M, et al. Identification of tissue transglutaminase as the autoantigen of celiac disease. Nat Med. 1997;3:797–801. Sjostrom H, Lundin KE, Molberg O, et al. Identification of a gliadin T-cell epitope in coeliac disease: general importance of gliadin deamidation for intestinal T-cell recognition. Scand J Immunol. 1998;48:111–115. Mothes T. Deamidated gliadin peptides as targets for celiac disease-specific antibodies. Adv Clin Chem. 2007;44:35–63. Corazza GR, Villanacci V, Zambelli C, et al. Comparison of the interobserver reproducibility with different histologic criteria used in celiac disease. Clin Gastroenterol Hepatol. 2007;5:838–843. Rostom A, Dube C, Cranney A, et al. Celiac disease. Evid Rep Technol Assess (Summ). 2004;104:1–6. Schwertz E, Kahlenberg F, Sack U, et al. Serologic assay based on gliadin-related nonapeptides as a highly sensitive and specific diagnostic aid in celiac disease. Clin Chem. 2004;50:2370–2375. Korponay-Szabo IR, Halttunen T, Szalai Z, et al. In vivo targeting of intestinal and extraintestinal transglutaminase 2 by coeliac autoantibodies. Gut. 2004;53:641–648. Cataldo F, Lio D, Marino V, et al. IgG(1) antiendomysium and IgG antitissue transglutaminase (anti-tTG) antibodies in coeliac patients with selective IgA deficiency. Working Groups on Celiac Disease of SIGEP and Club del Tenue. Gut. 2000;47:366–369. © 2018 Bernardo et al. This is an open access article distributed under the terms of the Creative Commons Attribution License , which permits unrestricted use, distribution, and build upon your work non-commercially.